Martin said the government has failed to grapple with the issue, which continues to get worse. 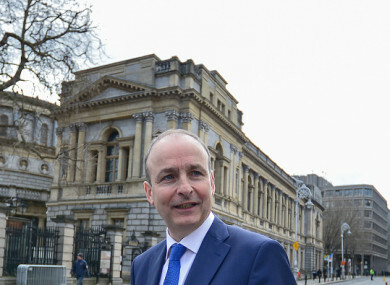 FIANNA FÁIL LEADER Micheál Martin said the government needs to prioritise dealing with homelessness in the next Budget. Speaking on RTÉ’s Sean O’Rourke programme this morning, Martin said the government has failed to grapple with the issue, which continues to get worse. The latest government figures published this week, puts the figure for homeless adults at 6,052 and the number of homeless children at 3,755, meaning just shy of 10,000 people are now homeless in Ireland. Yesterday, appearing before an Oireachtas Committee, the Taoiseach admitted that the homelessness and housing crisis was now a national emergency. Leo Varadkar said the latest figures show a “disturbing increase” in the number of families becoming homeless. He said he had no difficulty in describing the crisis as a “national emergency”. However, he said making such a declaration will not speed-up the number of houses that are built. “Yes it is an emergency, but declaring it an emergency doesn’t solve the problem,” he said. During yesterday’s committee hearing, the Taoiseach was also asked if he had started to renegotiate the confidence and supply agreement with Fianna Fáil. Varadkar said he would be wise to speak to Martin about that before discussing it in the public domain. This morning, Martin said his party has so far honoured the agreement – which has propped up the government since 2016. The agreement commits to supporting the government for at least three Budgets. “The forthcoming Budget has to prioritise this issue [homelessness]… it has to reflect the gravity of the situation and the kind of interventions that need to happen,” said Martin. He said there is a level of bureaucracy and red tape that is holding up progress in terms of housing construction, adding that there are quick things that can be done to get things moving. In the next Budget, Martin said Fianna Fáil need to see efforts made to get people off the housing list and a ramp-up in social house builds by local authorities. He said there needs to be a “dramatic shift” in the provision of affordable housing, and he said the State needs to “get involved” in building those houses. When put to him that Fianna Fáil has facilitated this government and has the power to force the government to act on the issue, Martin conceded that his party had given the government time to deal with the crisis. However, to date, he said it has failed to do so. “We gave them some space to get this resolved, they haven’t grappled it, I acknowledge that,” he said. The government “thought the market would solve this”, he said, adding that State intervention is badly needed at this point. Martin admitted the confidence and supply agreement is “challenging”, adding that his party has always been anxious since day one of this government to convey to people that they would not pull down the government at the earliest opportunity. However, he concluded by stating that as the situation stands now, Fianna Fáil needs to see “real evidence that this is being grappled with”. He said two budgets have passed and there needs to be delivery on the key issues. He told Newstalk Breakfast this morning that Fianna Fáil wants to see out the confidence and supply agreement. I think the forthcoming budget will be a challenging one. As I have said repeatedly, we take this step by step and one stage at a time. Yesterday, Martin reshuffled his front-bench, sparking speculation that his party is gearing up and getting ready for a general election. Absolutely we can win this next election. We’re actually in a much better position going into the next election than we would have been going into the 2016 election. Email “Micheál Martin says Budget 2019 must prioritise the homeless crisis”. Feedback on “Micheál Martin says Budget 2019 must prioritise the homeless crisis”.